you are here: Home » News » Ebooks Coming to Virgin America? Ebooks Coming to Virgin America? Could airlines start offering ebooks along with current in-flight offerings like movies and TV shows? I just read an interesting post on the EBookNewser blog that speculated about that possibility. 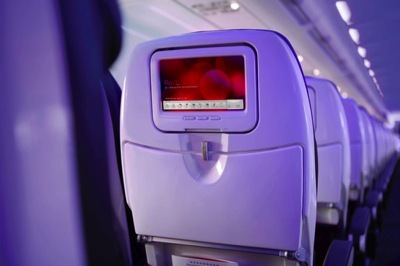 The author recently flew on Virgin America and noted that the in-flight entertainment system on the back of the seat listed a “Read” option as “Coming soon.” She wondered if they plan to start selling ebooks or even begin offering select books for free. It actually makes a lot of sense—publishers could offer books for free as a way to attract new readers. Unless it’s a really long flight, people probably wouldn’t finish the whole book, and then they would have to buy it. Or they could allow you to browse free excerpts of a variety of books, much like the Kindle store does now. I think this is a brilliant idea! I usually bring my own reading material, but I can think of a few times that my book turned out to be less than stellar, and I was stuck with it for the entire flight. This could be a fun way to discover new books and stay entertained during a long flight, so I really hope this is happening. What do you think about ebooks coming to airplanes?